Do you like beets? Do you really like beets? What is it about beets that you really like? I must confess, I’m not a big beet fan, but I have met a few big beet eaters in my day. Maybe it’s just because it’s the Pacific Northwest, and we like growing our food, and beets are easy, but people are so in love with their food. I could understand that, I guess. Plus, they are so good for you. Full of vitamins and stuff. Don’t get me wrong, if someone roasted them, sliced them, and put them in a salad, I would be very appreciative. But you could roast just about anything for me, slice it up, sauté it , toss it in a salad, and I’d be very appreciative. Or put it in a cake! 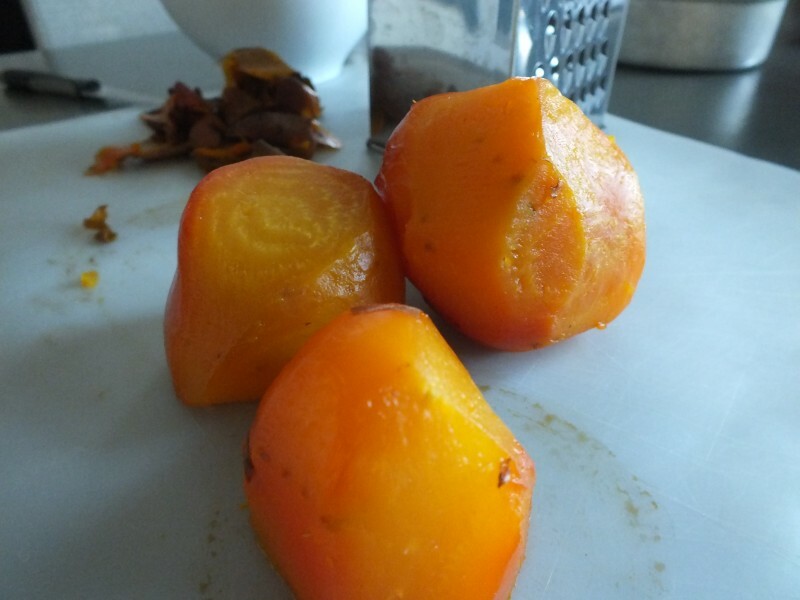 Preheat oven to 400 degree F. Scrub and dry 2 medium golden beets with a paper towel, wrap them in aluminum foil like a bag and secure by crimping the aluminum foil together, place on top of baking sheet in middle of the oven for about an hour until tender. Be careful when opening the foil, as there may be some steam released. Cool enough to handle, skins should be easy to peel. (Grate using a medium grate of a box, the second largest grate.) Squeeze against a sieve and save the liquid for the frosting. You should have several Tablespoons of grated beet, and about 2-3 Tablespoons of beet juice. Set both beet and juice aside. Make the brown butter. Reset oven temperature to 350 degrees. 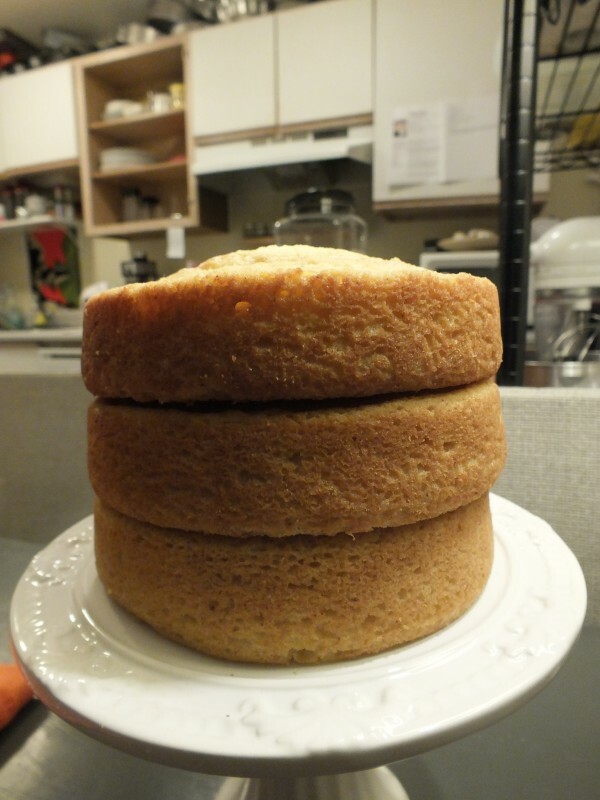 This recipe can make two layers of cake with two 9-inch pans, each with 2-inch sides, but I wanted a tall, but tiny cake, so I used three 6-inch round pans, each with 2-inch sides. Grease pans and add parchment paper to bottoms and grease again. Set aside. 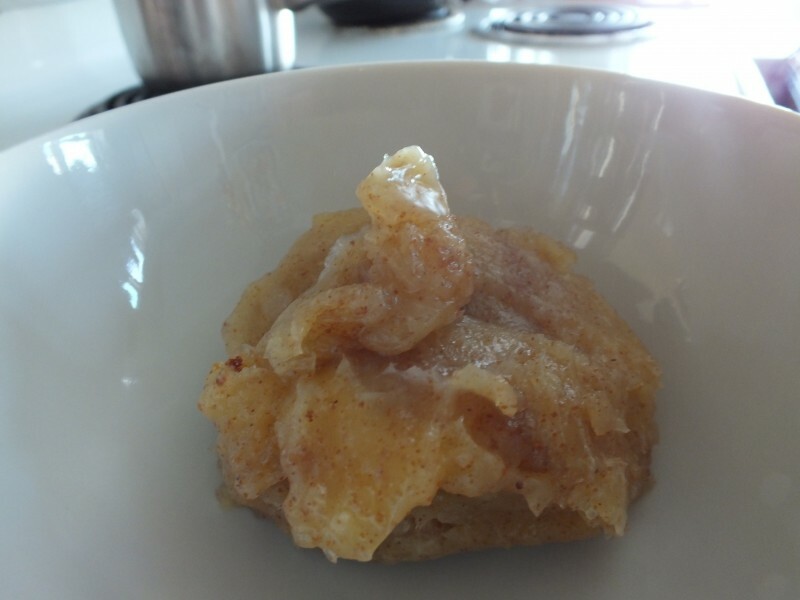 To make the brown butter, place butter in medium sauce pan and place on stove top on medium heat, stirring occasionally, until butterfat turns brown. Be careful and watch this, as it is not easy to see, but it can turn perfectly brown in one instant, and then burnt in another instant. This whole process can take five or more minutes, but you really don’t want to burn the butterfat, which gets bitter and unusable. 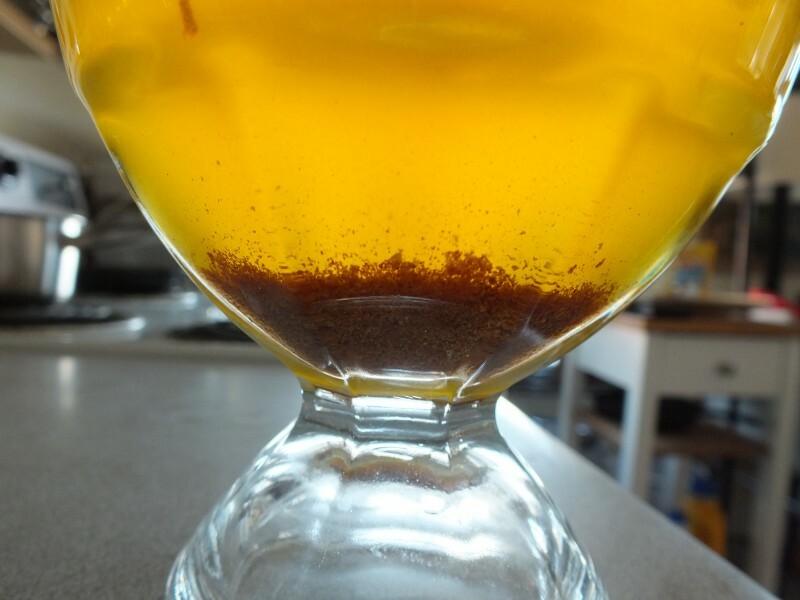 When you notice the butterfat particles have browned, take it off the heat and pour into a glass heat resistant container or bowl and place in an ice water bath to decrease the temperature. Stir until you notice the butter start to solidify. I ended up putting my browned butter in the fridge for 30 minutes, to get it similar to that of softened butter that you soften to use in cake batter. Sift the flour, baking powder, and salt, and stir with a whisk in the bowl to combine. Cream the butter with the sugar in a bowl, using a hand held mixer, or stand mixer. Add vanilla and mix more, scraping down sides of bowl as needed. 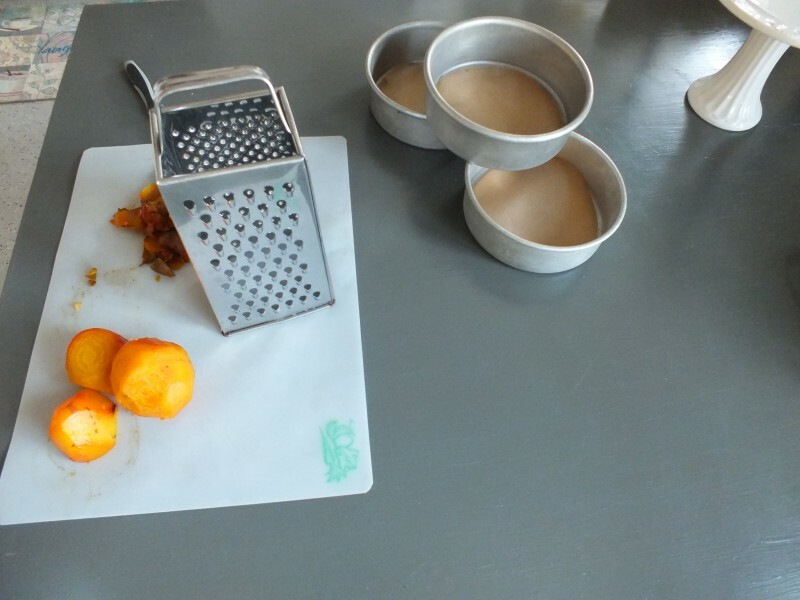 Add egg yolks one at time, then eggs, one at a time, continuing to scrape down sides as needed. Blend thoroughly. Starting with the flour mixture, add a third of it, then half the milk, and another third of the flour, followed by the rest of the milk, and finally the last third of the flour mixture, mixing with blender between each addition, scraping down sides of bowl as needed. Add 6 Tablespoons of grated beet, and mix thoroughly to blend. Divide evenly in pans used, using a mini-spatula or spoon to even out the batter. Place in center of oven for 40 minutes, until sides start to brown a little, and middle springs back when you press your finger down in the center of each cake. Tom Douglas version says to rotate pans at the halftime mark, but I didn’t. Of course, I was using the smaller pans. Place on a cooking rack for about 5 minutes before carefully inverting them on another cooling rack and flipping back right side up. Let cool completely before frosting. Blend browned butter until fluffy, add 8 ounces cream cheese and blend until smooth and fluffy. Add vanilla and two cups of confectioners sugar and blend again until smooth and spreadable. Level the domes on the tops of each layer of cake, if needed. I only had slight domes, but it helps keep each layer level and uniform. 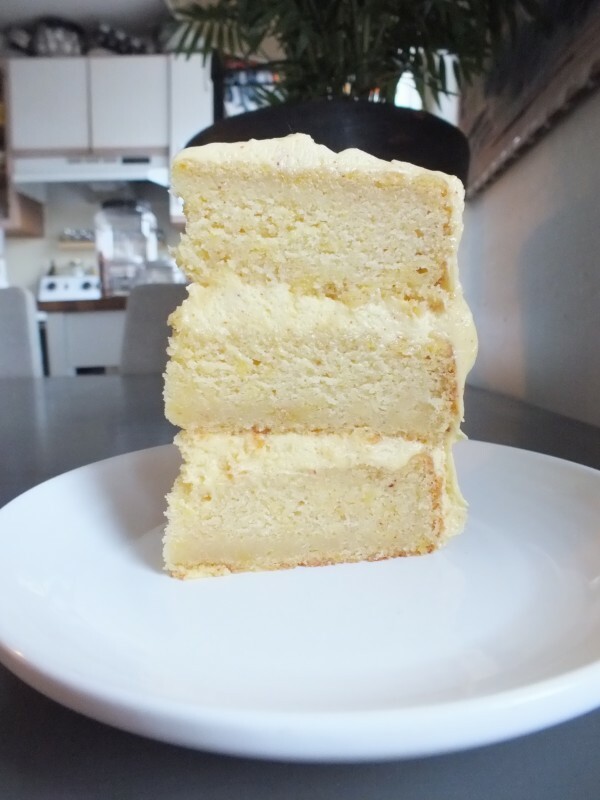 Place a small amount of the frosting on the cake stand and add the first cake layer o top of it. 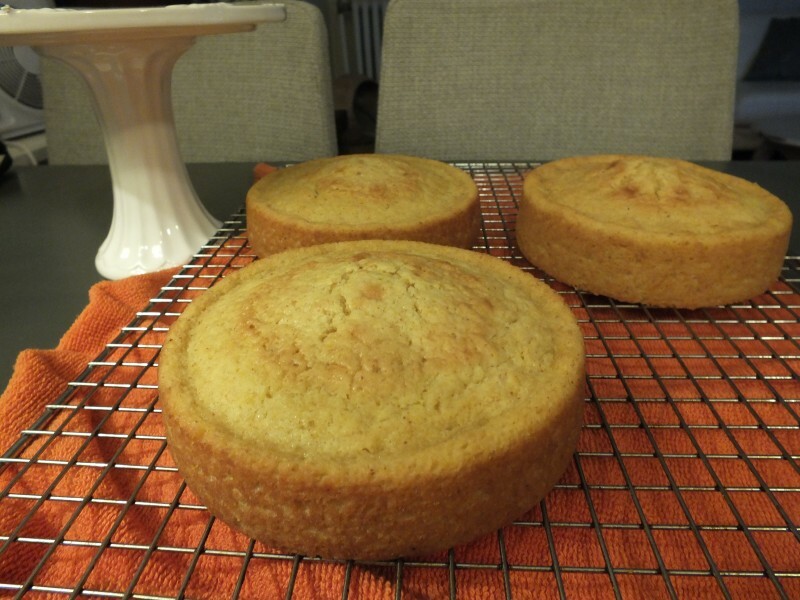 Add small pieces of parchment so that you don’t get frosting all over the cake stand. 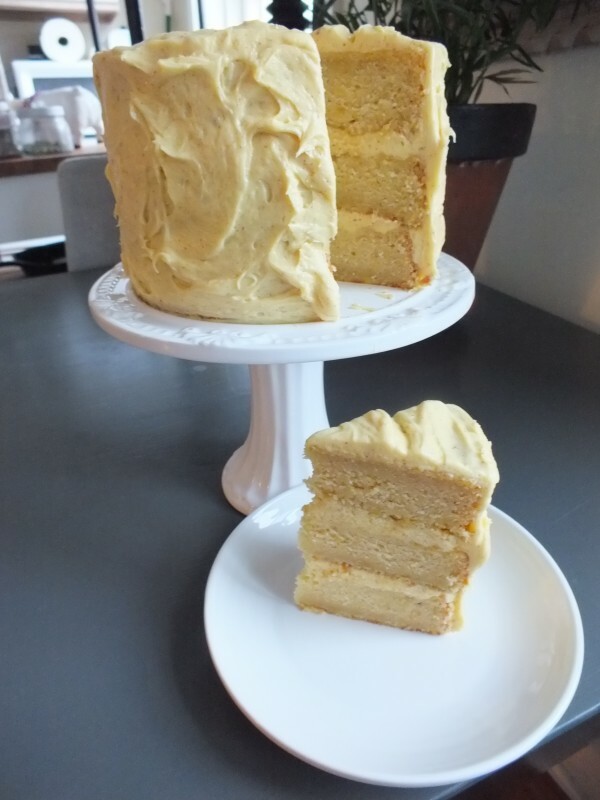 Place a large dollop of frosting and spread towards the edge of the cake with a thickness of about a 1/2 inch. place second layer and add another dollop and smooth it out with an offset spatula. Place the third layer upside down so the bottom of that layer is the top of the cake. Place in the fridge to harden the frosting somewhat so that it’s easier to then frost the rest of the cake. Finish frosting the top and sides, and serve. I had a slice with my morning coffee and it was excellent. I love the specks of brown butter in the frosting, which turned into a nice pale yellow from the beet juice. This entry was posted in cakes and tagged beets, brown butter, cakes, dessert, golden beet, golden beet cake. Bookmark the permalink.